The British army’s long and tortuous involvement Northern Ireland (ostensibly a full part of the UK) began in 1969 when they were brought in as a supposedly impartial force to restore law and order and mediate between opposing groups who use religious labels to differentiate themselves from one another. After an initial (brief) welcome, the British army’s perceived stance of neutrality soon disappeared and they became directly involved in a long and protracted three-sided war (four sided if you include the Republic of Ireland’s indirect involvement) that lasted for almost 30 years. 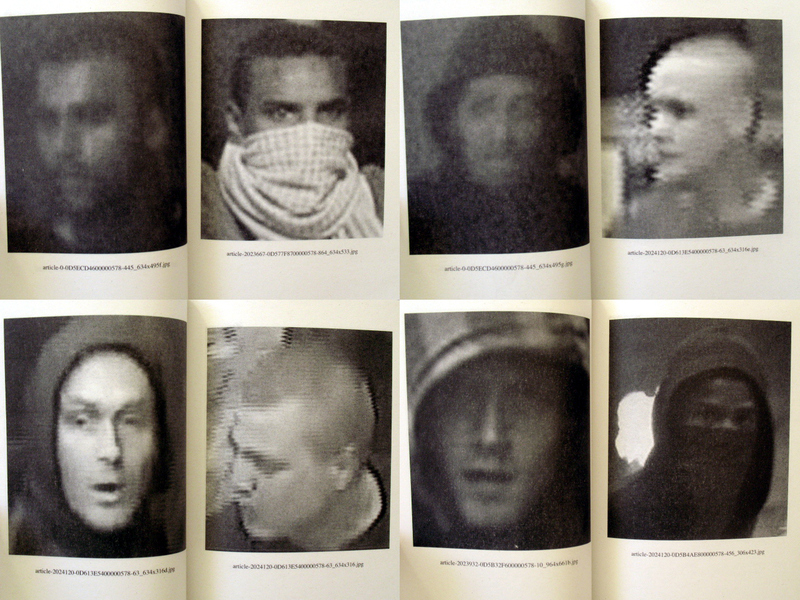 Official policy in London produced a stalemate in which an ‘acceptable’ level of violence was tolerated. No side in this tripartite conflict (known as the Troubles); British, Republican (Catholic) or Loyalist (Protestant) was powerful enough to defeat their opponents or be defeated by them. Any movement which attempted to change the rules of this deadly game (through political negotiations) would be met with an intensification of violence from their opponents. The result was utter stagnation and a complete polarisation of society with people being pushed to the extremes, which in turn eroded any sort of middle ground that would produce compromise in order to break the deadlock. 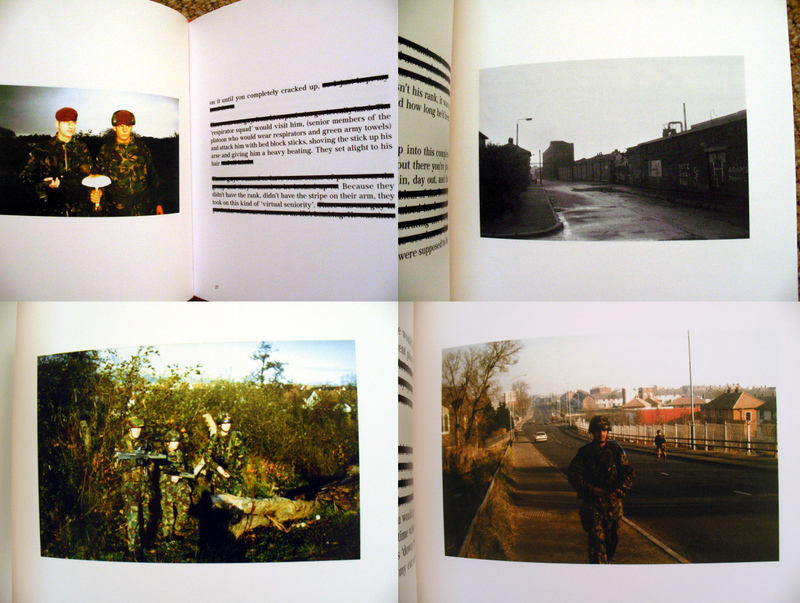 This then was the context within which the British army found itself in the 1980s and 1990s. Indeed much of what happened in Northern Ireland has been replicated in the Afghanistan and Iraq debacles which have consumed countless, utterly futile, and pointless deaths over the past decade. In Northern Ireland, the British army was involved in an unwinnable war, living under constant fear of being attacked and killed by an enemy that surrounded them. Under this situation, a siege mentality develops with everybody outside the group being seen as a potential threat. 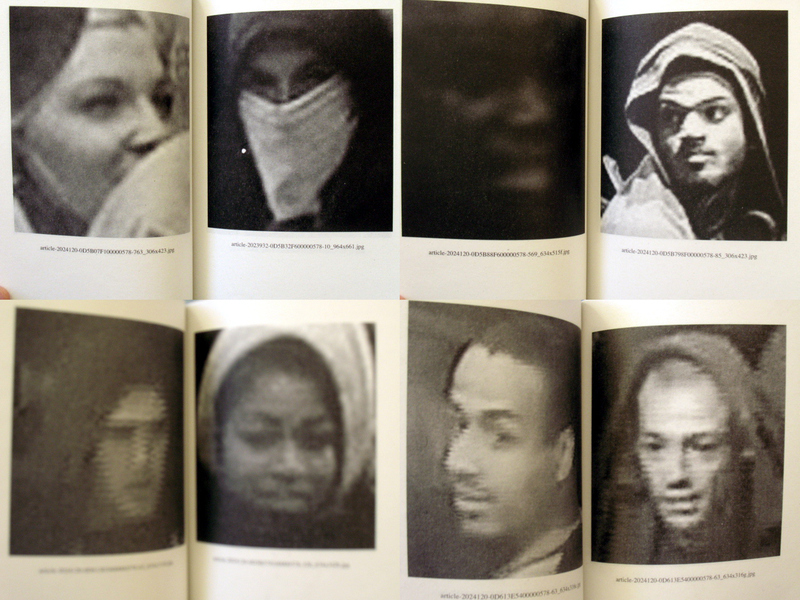 There is no identification possible with the people who the politicians say they are supposed to protect. Inevitably a toxic combination of frustration and aggression builds up and armed men exact their revenge upon the population (who they see as enemies) in a way that only deepens the spiral of violence and distrust. A prime example of this occurred in January 1972 when the Parachute Regiment killed 13 unarmed members of a Civil Rights march on what became known as Bloody Sunday. That severed all possibility of Republicans negotiating with the British; they had taken sides. By the 1980s the British army were living in barracks that looked like something from outer space, constantly living under threat of mortar attacks or ambushes, flying around in helicopters because some of the roads were too dangerous to use because of bomb attacks, and every excursion on foot became a synchronised ballet of armed acrobatics with garden walls and hedges serving as props to hide behind. Just like Iraq and Afghanistan, negotiations and political compromises are inevitable in these situations – the question is just how long it will take and how many people have to die before the politicians sit around the table and hammer out some sort of a deal. In Northern Ireland it took 30 years. This then is the context in which a 17 year old Stuart Griffiths finds himself when he arrives in Northern Ireland as a member of the Parachute Regiment (particularly hated in Republican areas because of Bloody Sunday). As well as being surrounded by hostile population in an unfamiliar, alien society, Griffiths also has to come to terms with his own place and identity in the all pervasive culture of macho-violence which dominates military institutions. Initially, his photography serves as a way to gain acceptance by his peers but it evolves and changes with Griffiths experiences in the army. 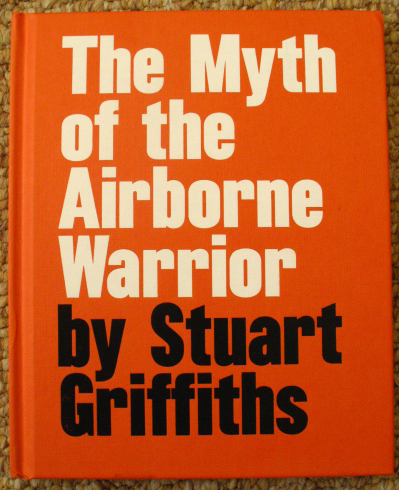 This book is a narrative about his individual response to the alien military structure he finds himself within, the myth of the fearless warrior which first attracted him to the army and his personal coming of age as a young adult, all whilst attempting to cope with a situation where he is completely surrounded by violence. 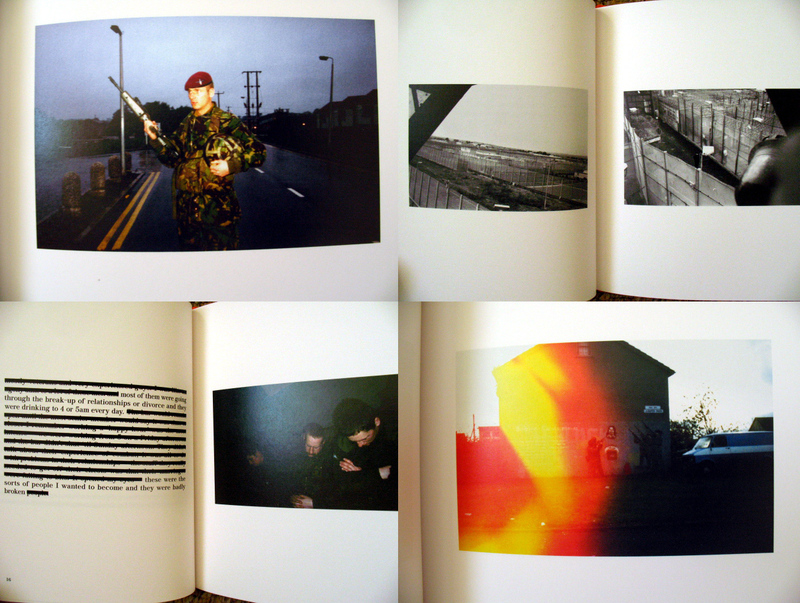 The book is a small red hardback (it reminds me of a school notebook I had for science class for some reason) and consists of a series of images (with an accompanying text) made by Griffiths during his assignment in Northern Ireland sometime during the late 80s or early 90s. 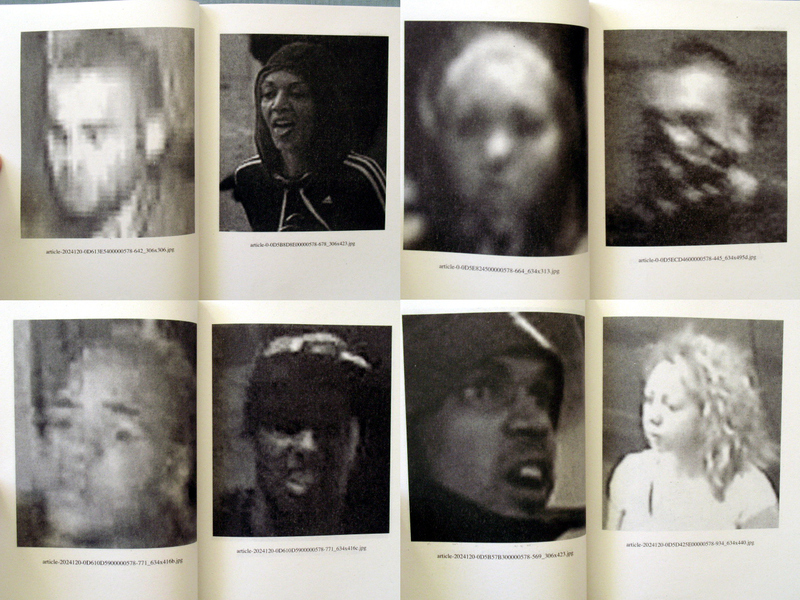 Alongside the book, a number of items, as well as a signed 6×4 print, accompany this work. 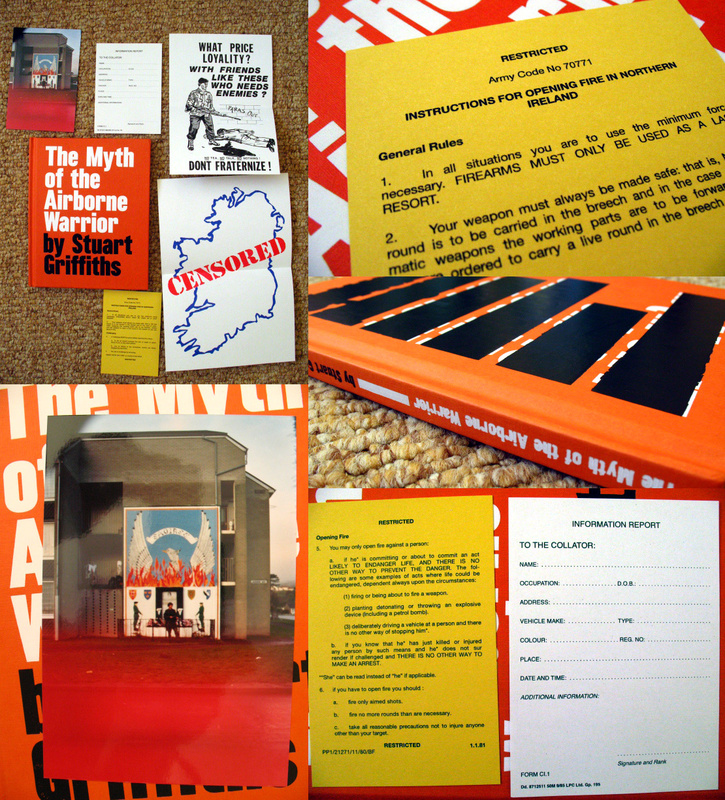 This ephemera provides us with examples of the familiar, official, paperwork of the Troubles; on the army side you have a card for recording surveillance information and a list of rules when it is legitimate to shoot somebody, while two Republican propaganda leaflets provide an opposing viewpoint in which the British are presented as a murderous army of occupation. 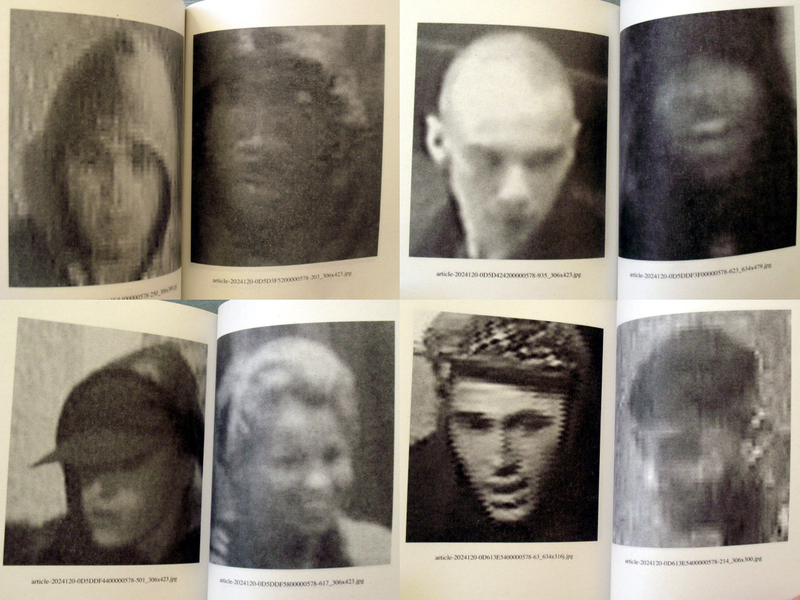 Censorship, both official and self inflicted, pervades this work. 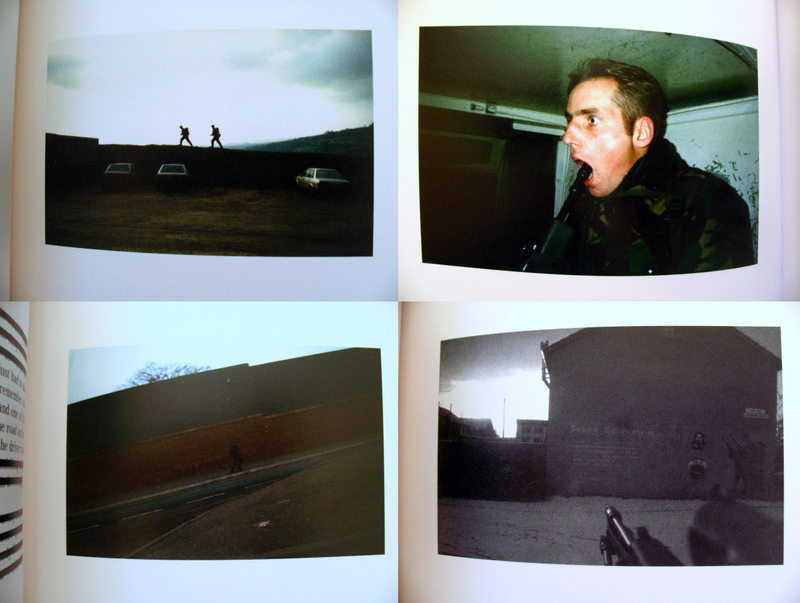 As well as the images, made with a cheap snapshot 35mm camera, within the book Griffiths provides an autobiographical account of his own journey and conflicting impressions of this situation. 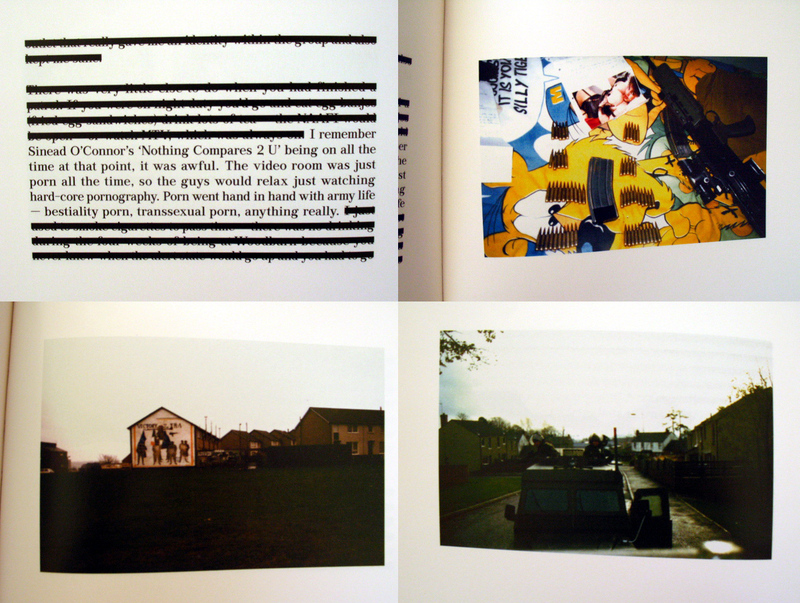 However, reminiscent of the heavy control of information that was part and parcel of the official British response to the Troubles, much of his text has been redacted (blacked out). 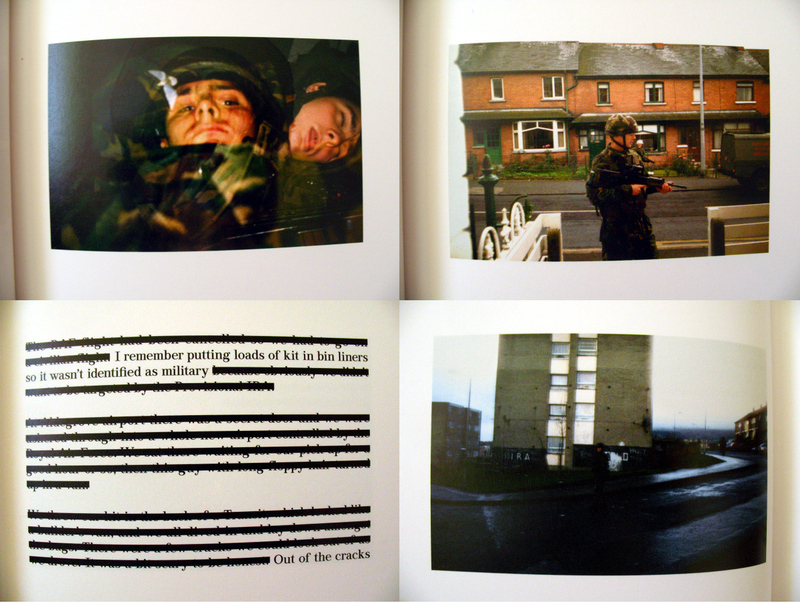 Fragments of sentences remain from which it is possible to glean tantalising insights into army life in Northern Ireland, but like all wars, the bigger picture and the whole story are difficult to discern. Details are simplified and expanded in a way that eliminates context. Yet, this narrative is not a blistering expose of what happened; it is Griffiths personal account of what he experienced during this time. In a way we all engage in a form of self-censorship and our life stories are a collection of selective memories that we use to create our own personal mythical narrative. Blacking out the parts we don’t want to remember has always been an important survival mechanism. Censorship also allows for the creation and invention of myths by controlling what is presented to the outside world; here the fantasy of the heroic soldier is subjected to more than critical scrutiny. As has been observed, joining the army is like staying in school forever; with its hierarchical structure, rigid rules, strict conformity, bizarre routines, arcane traditions, lack of individual responsibility and the perpetuation of heroic stories about the glorious dead (who are valued now precisely because they are dead – how they ended up being killed is never mentioned), the military sets about creating a culture and ethos that separates this group from the outside world. 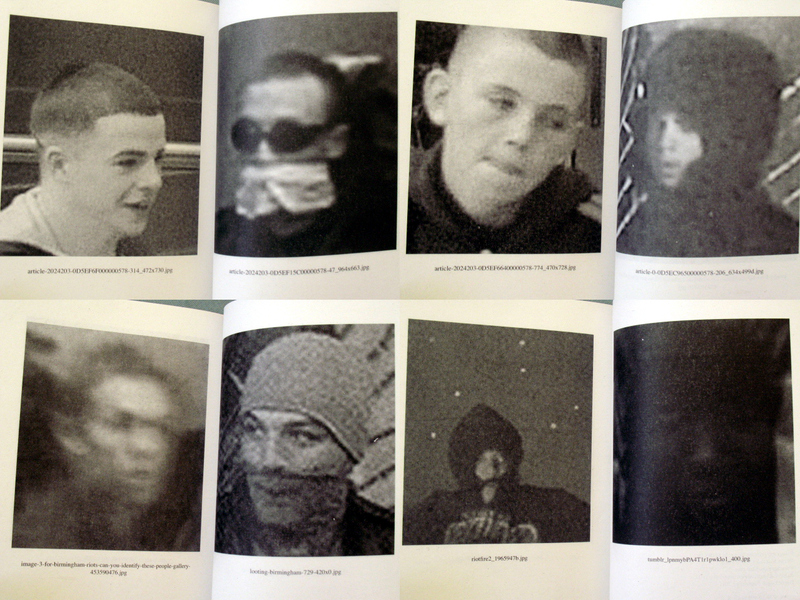 Griffiths snapshot images have a quality about them that remind me of school trips and feckless teenage life; the puerile humour and immature, juvenile attitudes are familiar to any group of testosterone fuelled young men let loose on the world. Most of the photographs are in colour and appropriate the snapshot aesthetic, which in this case, gives the work an immediacy and power that more carefully composed images would not have provided. The images can be divided into two groups. 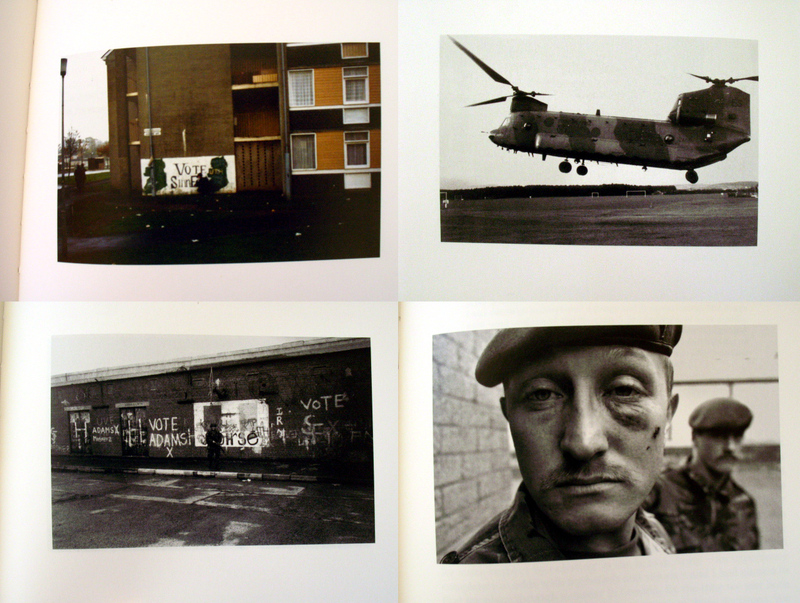 There are photographs of soldiers on patrol in sinister graffiti daubed, dimly lit, red brick suburbs that remind us of the imagery presented in the media of the Troubles. We expect to see these photographs. These images of squaddies out and about in their official role are full of the mock bravado that soldiers are expected to display and that are a feature of personal snapshots of armies the world over. In contrast, the images of barracks life, the private, unseen space, hidden from view behind blast-walls, are of a different order. Within these confines the public facade breaks down. Without their mythical status to define them, these individuals are shown as solitary, often damaged people, worn down by despair and suffused with suppressed violence. 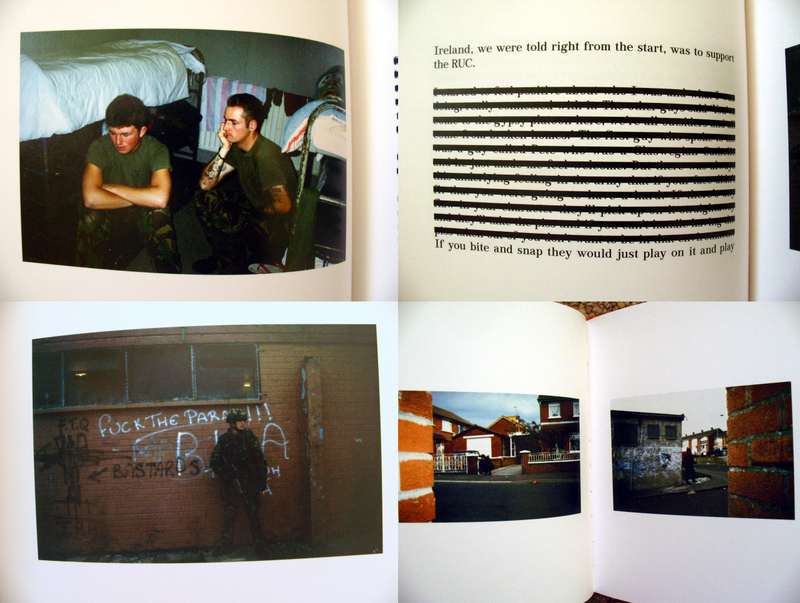 This book is not a work of war photography; we see no images of blood on the streets, overt violence or dead bodies. Instead we are presented with the quiet, considered account of an individual trying to come to terms with the bizarre, frightening and stressful situation in which he finds himself and, in my opinion, is all the more effective because of it. This ambitious engineering feat, linking the Pacific and Atlantic, finally opened in August 1914 just as the world’s attention was diverted by rather more pressing matters which rather stole the thunder of a project which provided a template for the exercise of US power over foreign countries that continues to this day. The late nineteenth and early decades of the twentieth century saw the US move away from its introspective isolationism and adopt a more expansive stance towards the rest of the world. Yet, for a country who defined itself through concepts of anti-colonialism, liberty and freedom, it was a hard sell for a domestic audience that they should get involved in subduing foreign countries, although some tentative steps had already been made in the Philippines and Cuba. Roosevelt first helped to create the state of Panama by assisting it to secede from Colombia in 1903 and then negotiated a deal with the new state that would give the US a free hand to do whatever it wanted. A strip of land around the proposed canal route was designated a ‘Zone’ under direct US control, (military rule prevailed for most of the construction) to allow them to complete the work without having to worry about what the locals thought. The parallels with big business and corporations moving into Iraq and Afghanistan under the auspices of a local US controlled puppet government which ruled nothing more than a small area of blast proof concrete in the capital city in order to provide a fig-leaf of democratic legitimacy to exploitation on a huge scale, are readily apparent. In effect, Panama set the ground rules for how the US would conduct its affairs after the Second World War; a weak local government charged with maintaining order and controlling the local population does all the dirty work while everything else is subject to American interests. 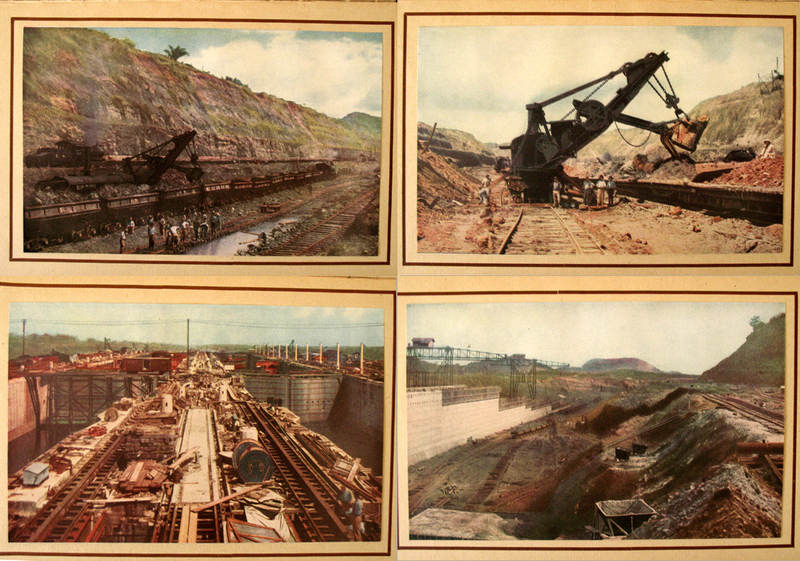 Much of the narrative about the Panama Canal presented for a domestic audience revolved around American superiority; in effect, so the story went, the French had failed because they were representatives of an old and backward nation that had neither the work-ethic nor the machinery to do the job properly. A newly confident nation would soon set that right. Conditions on the Canal construction site were tough; the tropical climate, hard work, disease in the form of Yellow Fever and Malaria and ever present industrial accidents meant that death was never too far away. Roosevelt tried running the Canal with civilians but eventually he gave up and sent an army man to take command and run it on military lines to bring order to this vast and expensive project upon which his Presidential reputation rested. In the early years of the construction a number of corruption scandals arose which rather tainted the idea that this was some sort of grandiose experiment in democracy or that the Canal was a gift to the world; it was no such thing. It was primarily designed to enhance US strategic interests, project naval power and enhance their ability to control both the Pacific and Atlantic Oceans. The Panamanians were mere pawns in this geopolitical game. A strict hierarchy was maintained within the Canal; at the top of the tree were the white American administrators and engineers who ran the show, followed by white American machinists and operators who manned the equipment, then the unskilled European labourers and, finally, black labourers from the West Indies. However in order to avoid charges of racism, segregation was maintained through payment methods; the white Americans were paid in gold, while the rest received silver. Like something out of Apartheid South Africa, there were two separate entrances or counters for every aspect of life in the Zone; one for gold employees and another for silver employees which insidiously enforced a racial segregation in every aspect except name. This book was published in 1913, a year before the Canal was completed, to satisfy the demands of an American public who were intrigued to see what was happening in the Isthmus. As for the photographer, Earle Harrison, I haven’t had much luck in finding much out about him (there are a number of images credited to him on the National Geographic website) so if anybody has more information please let me know. A major distinguishing feature of this book is that he used the autochrome process to produce colour photographs of the Canal in contrast to the black and white images which account for much of the other construction photographs. 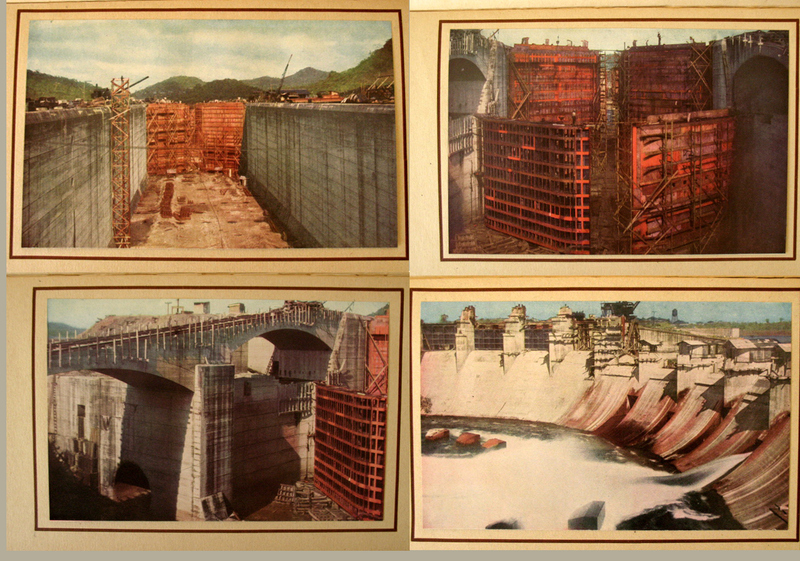 The book makes much of the autochrome process, turning it into a novel selling feature obviously designed to increase interest in the images and provide a more ‘realistic’ vision of the Canal construction to a public hungry for news about this prestige project in the jungle. By 1913, the autochrome process was well developed and was in use by a number of photographers although its expense meant that black and white would remain the predominant visual mode of representation for decades to come. 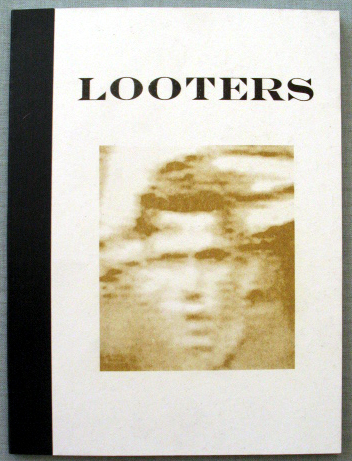 The images themselves are tipped into the book made up of sepia toned pages, surrounded by a dark brown border, facing a page of text which serves as a form of extended caption for the image, explaining to the viewer what it is they are seeing. 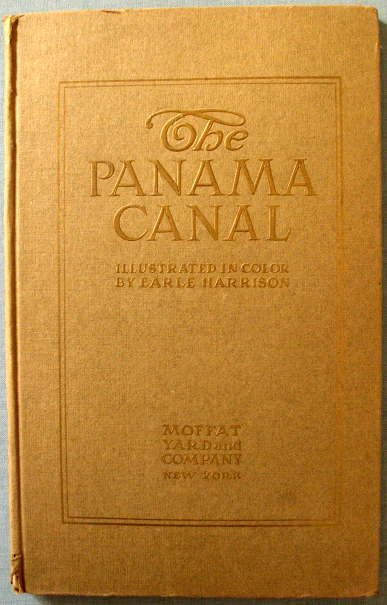 Although Harrison dedicates the book to the workers on the Canal, they are not the focus of his work. They may make a fleeting appearance alongside a crane or on a lock gate, but the individual is overwhelmed by the scale of the project. There are no close-up images within the book – Harrison stood well back and made panoramic images of what he saw around him, emphasising the monumentality of the construction and the vastness of the challenges which American ingenuity had overcome. 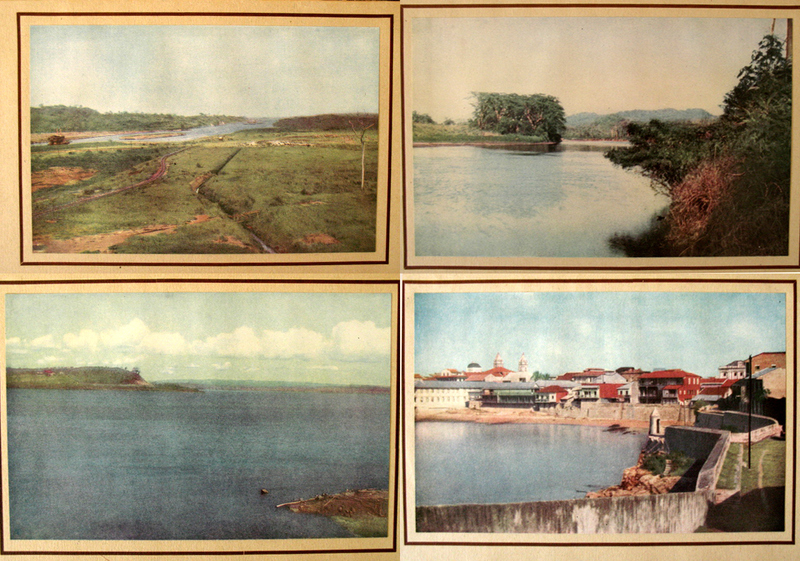 The resulting images produce a heroic narrative of triumph over adversity and the conquest of nature with the final images showing the artificial lakes constructed and the neat, whitewashed towns that had been reclaimed for civilisation and progress. Simply put in Rumsfeldian terms, ‘old’ Europe had failed once again; where the French had crashed and burned, American superiority had prevailed. Regular tourist trips were being organised to visit the constructruction site by this time, indicating the level of public interest in a project which had demonstrated by now that it was likely to succeed. 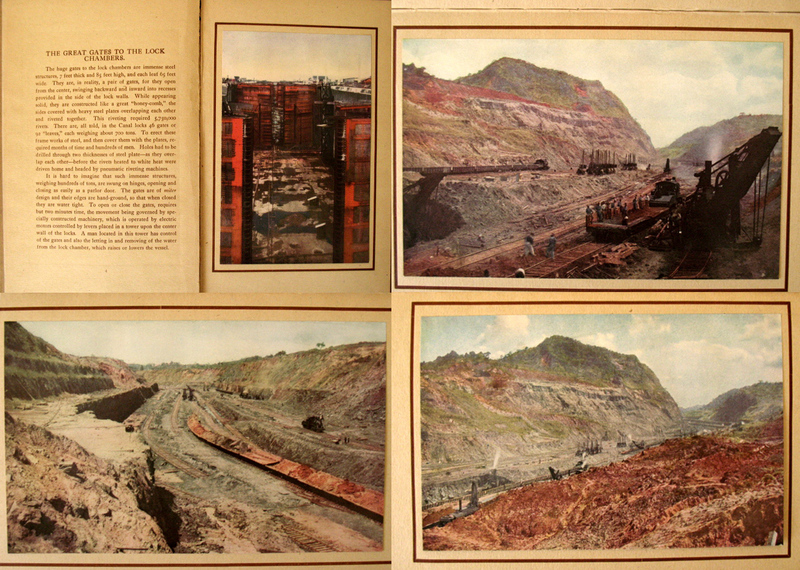 This book was clearly designed to feed into this interest by producing a narrative that combined (often contradictory) elements of imperial bombast, the superiority of democracy, industrial might, engineering cunning, racial exceptionalism and man’s ultimate triumph over a cruel nature, illustrated by colour images which purported to provide the distant viewer with a true sense of the scale of the endeavour they should be proud of.